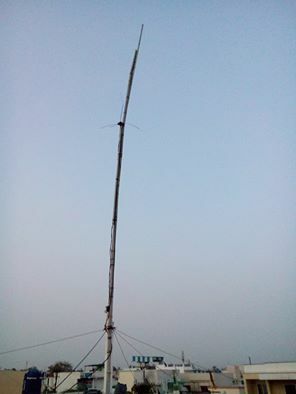 My friend, OM Rakesh Mishra, VU3PUA from Bhopal (Madhya Pradesh) on 20 meter band radiates 500 milli watt signal all over the India with 55 report. I pleaded him for the "secret". He kindly gave me the ckt diagram. With his permission I am posting this. Hope it will be useful to all hams. His transceiver is entirely homebrew of his own design. His transmitter is just 500 milli watt. I have seen many hams using big rig set to 5 watt and establish the com and then drop down to milliwatt, but VU3PUA use just 500 milli watt for all work. Recently in August 2015 he has made a 6 bans SSB QRP transceiver using the Chinese kit. So, you are sure to hear him in all bands. I am thankful to VU3PUA, Mishraji for sharing this wonderful design and hope to try it one day. There is one or two more silent features which after clarification will put here. How to tune it ? put the diode probe with VOM meter / VU meter. Tune it for maximum deflection. Please use the analogue VOM. Don't use digital multimeter. That's it folks, the wheel have been re-invented and use it. Radials are random length fitting to the QTH but alteast quarter wave and straight. fThe Vertical portion is 16 feet 7 inch. Quarter wave legth for 20 meter. 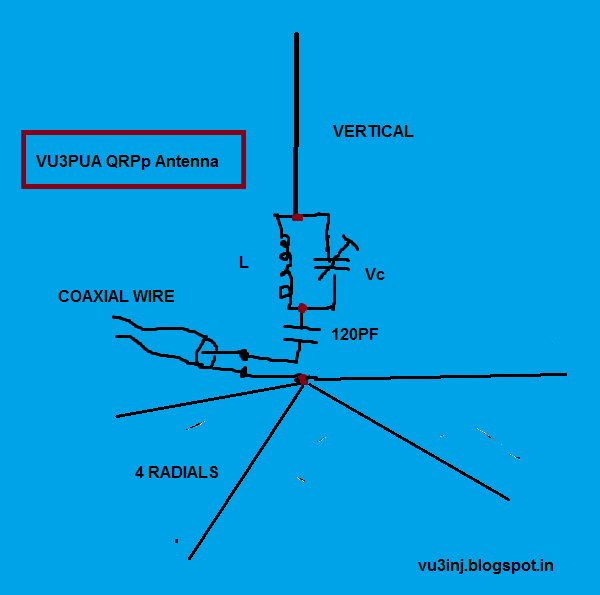 In the antenna pictures you will see the VHF antenna is also used with same cable and the tank prevents VHF going back to HF set. 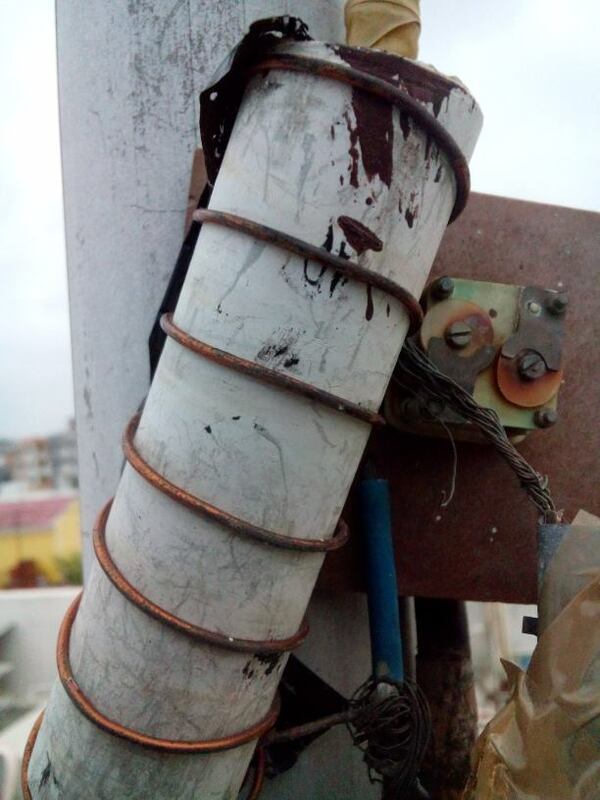 Was awaiting confirmation of one small finer details regarding the size of the coil. here is the picture. May be it is about 3 inch long and space wound. 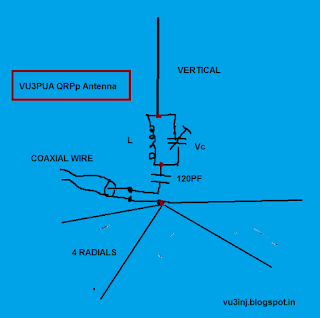 nice write-up about mishra ji's vertical antenna (QRPP) !! 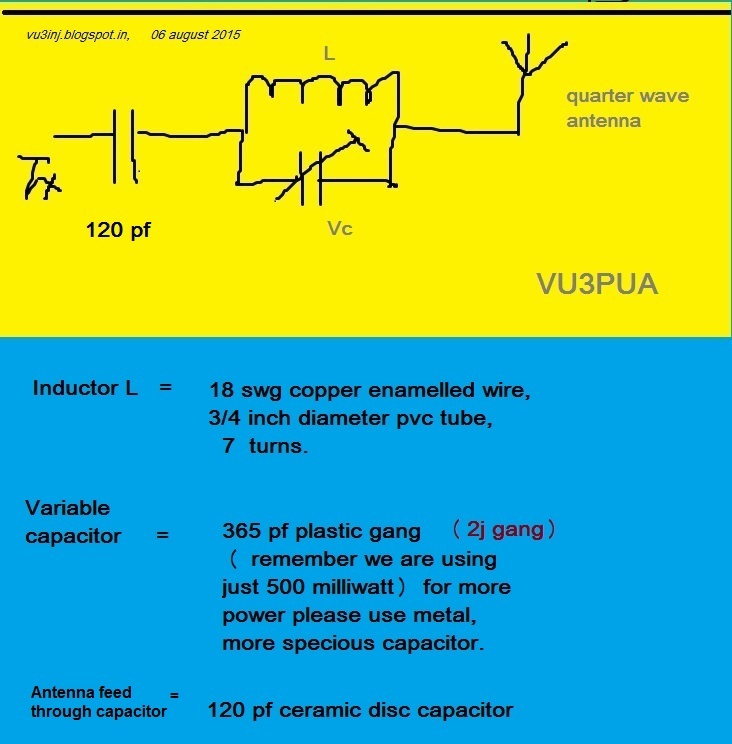 I have worked with Om VU3PUA on 20mt. his tcvr with 500mw is doing great. This shows that qrp is fun.